PLUMPTON-WOOD, a village and a parochial chapelry in St. Michael-on-Wyre parish, Lancashire. The village stands near the Lancaster and Preston canal, 1¼ mile S W of Barton r. station, and 4¼ N W by N of Preston. The chapelry also contains the hamlets of Catforth, Eaves, Higher Plumpton, and Lower Bartle; and its post town is Preston. Acres, 4,722. Real property, £9,516. Pop. in 1851, 1,574; in 1861, 1,462. Houses, 292. The property is subdivided. The manor belongs to Birley, Esq. P.-W. House, P.-W. Lodge, Swilbrook House, Barnfield House, Hollowforth, and Bartle Hall are chief residences. Extensive tile and drain-pipeworks are at Eaves and Catforth. The living is a p.curacy in the diocese of Manchester. Value, £175. * Patron, the Vicar of St. Michael-on-Wyre. The church is ancient, and was modernised in 1852. There are a Wesleyan chapel, a Primitive Methodist chapel, a Roman Catholic chapel, an endowed school with £23 a year, a small workhouse, and charities £24. Local studies information is held at Preston library. Details about the census records, and indexes for Woodplumpton. You can also perform a more selective search for churches in the Woodplumpton area or see them printed on a map. The Register Office covering the Woodplumpton area is Preston. Ask for a calculation of the distance from Woodplumpton to another place. "WOODPLUMPTON, a chapelry in the parish of St. Michael-on-Wyre, county Lancaster, 4 miles N.W. of Preston, its post town, and 3 S.W. of Garstang. It is situated on the line of the Lancaster railway and canal, near the river Wyre, the mouth of which forms a harbour. The union poorhouse is situated here. The village, which is considerable, contains many new houses. The living is a perpetual curacy in the diocese of Manchester, value £140, in the patronage of the Vicar of St. Michael-on-Wyre. The parochial charities produce about £37 per annum, of which £23 goes to Catforth school. In 1835 Woodplumpton was a township in the parish of St. Michaels on Wyre. 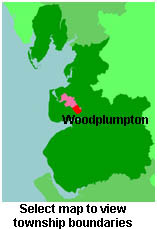 You can see the administrative areas in which Woodplumpton has been placed at times in the past. Select one to see a link to a map of that particular area. View maps of Woodplumpton and places within its boundaries. For probate purposes prior to 1858, Woodplumpton was in the Archdeaconry of Richmond, in the Diocese of Chester. The original Lancashire wills for the Archdeaconry of Richmond are held at the Lancashire Record Office.